Winnie & Walter and Chibitronics Collab Blog Hop! Welcome to Winnie & Walter and Chibitronics collaboration blog hop. I am so excited and nervous at the same time because this is my first time working with Chibitronics circuits. I admire the cards made by using them but the fear in me to try it out weighted my desire to use it. But after trying it out for this collaboration, it is not as hard as I thought it would be to use it. Darn! Why didn’t I give it a go earlier? Kicking myself now. Anyhow, I now know it is simple and easy and will use it more often on my projects. You should have come fromVanessa Amann‘s blog. If not do not worry I will list all the participant in this blog hop towards the end of this post. Here is my project for the collaboration blog hop. I used Winnie & Walter’s My Precious stamp set and creative screening Big Bang Sci-Fi Star to create my card. I stamped the multifacted stones from the stamp set using Versafine onyx back ink on kraft cardstock panel using MISTI. I left the stamps in the MISTI because after colouring, I want to re-stamp the images to get a crips outline. To colour the images, I used Faber Castell Polychromos pencils. I have coloured the images in several layers using three shades of each colour to achieve the shading and depth. Then I put the panel back into MISTI and stamped over the coloured images using the same versafine onyx black ink to get crisp outline. Since the background was a bit plain and empty , I placed the Sci-Fi Star creative screening stencil over the stamped images and sponged white pigment ink on the stencil avoiding the coloured images. Now the background has more interest and looks fuller. I also used Sakura silver and gold sparkle pen to add dots for more glitter to the background. I only want three of the jewels around the sentiment to shine. So I used the poky tool to poke holes on the large three jewels. I then placed the the panel on the card base as guide and used a pencil to mark spots through the hole on the card front. Then I used the Chibitronics pack to make circuits and add lights on the marked spots. The battery is held down by foam adhesive around it on the bottom left of the card base. The exact spot where the yellow jewel is on the kraft panel. I place the kraft panel back on the card base to make sure the light is in right spot and all is working well. I added double foam adhesives behind the kraft panel to adhered the panel on the card front. On the yellow jewel on the kraft panel, I used copic friendly pen to write “Press Here” so the reciever will know where to press for the light to glow. The sentiment also from My Precious stamp set is white heat embossed on a strip of black cardstock and adhered as shown. Finally I added Iridescent Diamonds from Little Things by Lucy on the holes where the light glows and a few scattered. The light through the diamonds are more diffused and glowing. Love it. Here is a small video and a photo of the light glowing in the dark. Very cool huh! I love it. I cannot wait to something a bit more complicated. Hope you like this idea. All supplies used to make this card are listed below at the end of the post. Here are all the details of the blog hop. Your next stop is to Heather Hoffman‘s blog. Here are the list of all the designers participating in the hop. No blog hop is without giveaways. Comment on all the blogs and one random winner will receive a $30 chibitronics start kit and $30 credit to the w&w shop. Thanks so much fro stopping by! Have fun hopping. I love your pretty card! Love your sparkly card. Great background for the pretty jewels. What a fantastic card you made !! 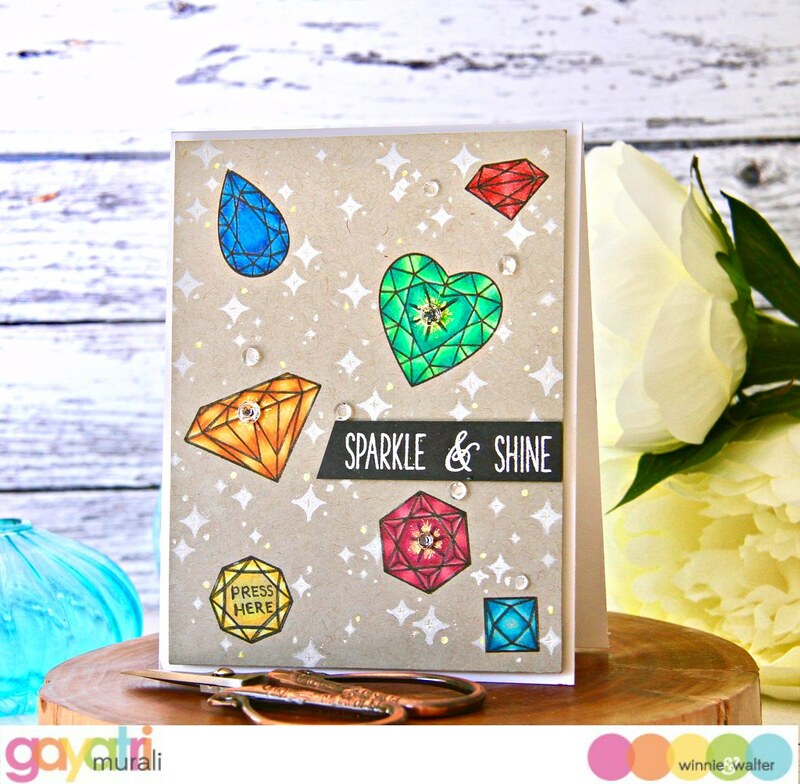 Incredible coloring of your cool gems Gayatri! Love the brilliant light that the light emit on my card. Stunning chickie! These sparkling jewels look amazing! I love this idea! Very pretty card and a very fun design too! Wonderful card! The background is the perfect subtle backdrop for your brightly colored jewels. The lights are the icing (and sprinkles!) on the cake – fantastic! Beautiful card … you did an amazing job on your first time using these fun products. I’ve never used them either but might have to give them a try! Oh wow!!! This is so beautiful!!! The background is just perfect to hi light all of those pretty jewels! Beautiful!! Beautiful card. Love how it sparkles. Cute. I like the kraft background and the colorful light up gems. This is gorgeous!!! I love the colors you used! Lovely card, very bright and colorful. Thanks for the chance to win and sharing. I love blog hops because they inspire me to create–thank you!!! Such a fun and awesome card! 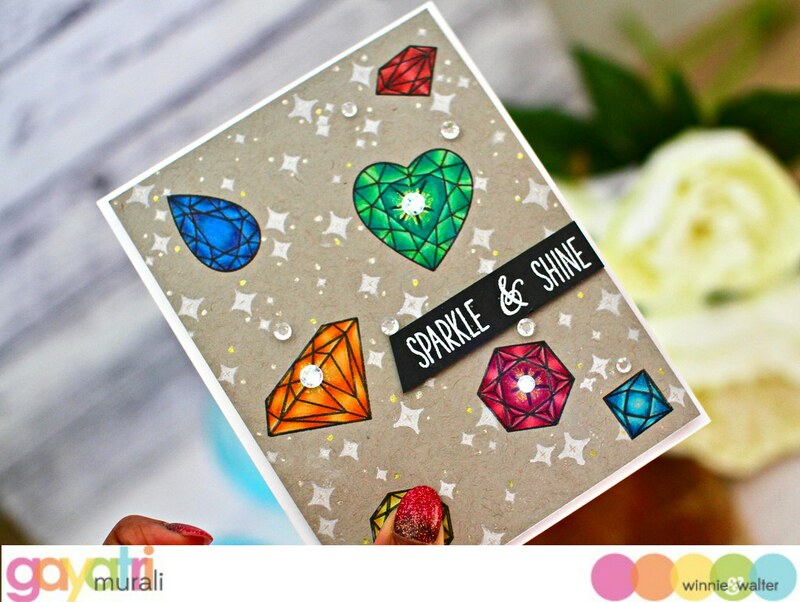 I love all the elements to your card: the background, the colored gems, the lights, and the drops. It all combines for a “shine” or sparkle effect. Thanks for sharing! I love the lit up gems. Very nice coloring! This is what every girl wants!! A card with sparkle and SHINE!!!! Great “gems”!!! Very cool! These gemstones are so pretty and the lights really make them extra-special. Gorgeous card! How cool to make the jewels really sparkle! Love the way your coloring pops! This card really brings these products to life. Thanks for sharing your creativity. 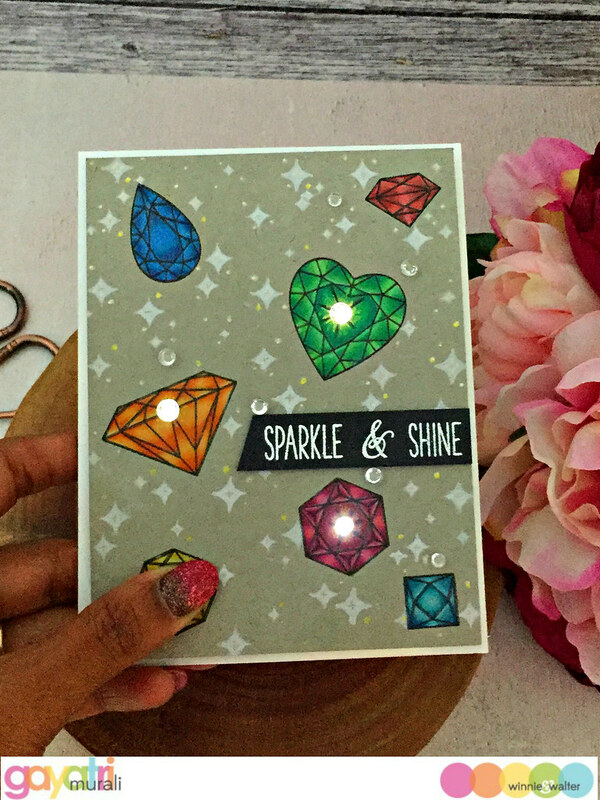 I can’t think of anything I would love more than a large, sparkling gem but to have them light up on a card given to me is even better.